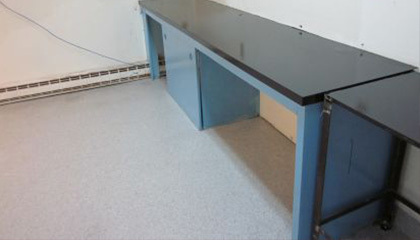 Pharmaceutical flooring requires sanitary solutions that are durable, seamless, chemical and slip-resistant. Black Bear’s on-site contractors in pharmaceutical environments are skilled in maintaining GMP practices, dust control, gowning requirements and always use HEPA filtered equipment to minimize environmental impact. We have a responsibility to our clients to minimize a project’s impact on the client’s processes. We take steps to reduce manufacturing downtime and insure a contaminant-free production zone in labs and other CNC spaces. 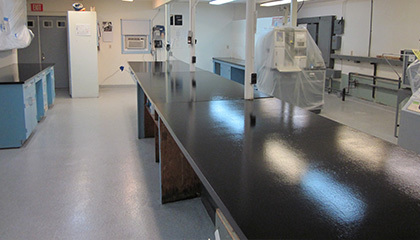 Black Bear Coatings & Concrete has extensive experience working with pharmaceutical clients to create custom flooring solutions that not only meet industry regulations and are easily cleaned, but that also enhance the overall aesthetics of the building’s environment. Black Bear has engineered solutions for many pharmaceutical facilities in Southern New England including: Bio-Rad Laboratories, Bristol Myers Squibb, and Luvak Research Lab. Talk to Black Bear about designing and installing a beautiful, durable surface for your pharmaceutical facility. Fill out the online form and a client representative will be in touch. Or, please call 978-405-0017. To learn more about industrial flooring for the pharmaceutical industry, check out our guide to choosing the right flooring for life sciences.